The minister said there will always be people who present as homeless. “There will always be people whose circumstances, through no fault of their own, means they need the support of community services. 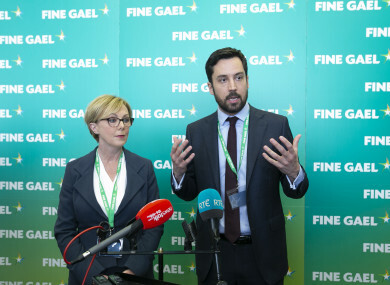 Murphy hit out against Fine Gael’s former government partners, criticising Labour for previously promising to end homelessness after the death of Jonathan Corrie in December 2014. He said such a promise was “very irresponsible”. “I remember, I think it was after Jonathan Corrie died, I think the Labour Party committed to ending homelessness by 2016 which I think was very irresponsible at the time because it’s an incredibly complex challenge,” Murphy said. Former Housing Minister, Labour’s Jan O’Sullivan commented on Twitter after Murphy’s criticism. “If he reads the plan in his Department he will see that it was to end long-term homelessness, it had specific proposals to achieve that: I believe would have been a lot more effective than Rebuilding Ireland has been,” she said. Answering a question by TheJournal.ie about the homeless figures going in the wrong direction, Murphy said not all the numbers are going in the wrong direction, stating that the government is building a lot more houses. He added that the latest figures show that more families are exiting emergency accommodation. Email “Murphy says it was 'irresponsible' to promise to end homelessness”. Feedback on “Murphy says it was 'irresponsible' to promise to end homelessness”.